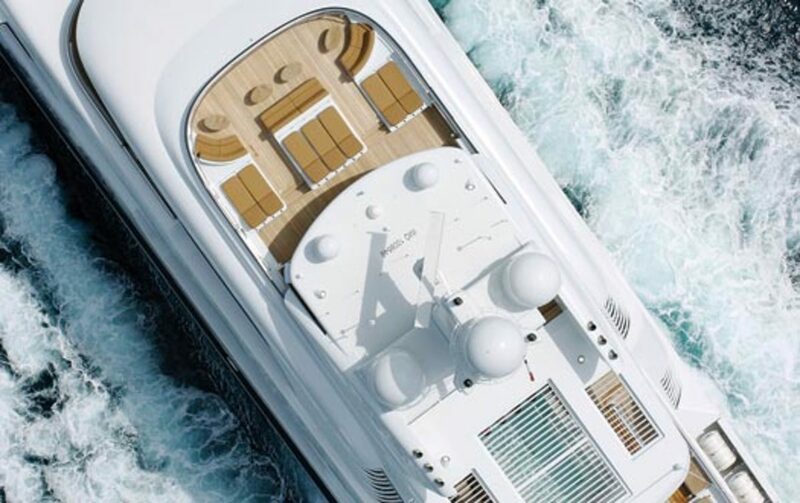 The two Caterpillar 3512s at the heart of the yacht occupy a vast, two-floor engine room presided over by chief engineer Paul Hartigan, of Brisbane, Australia. 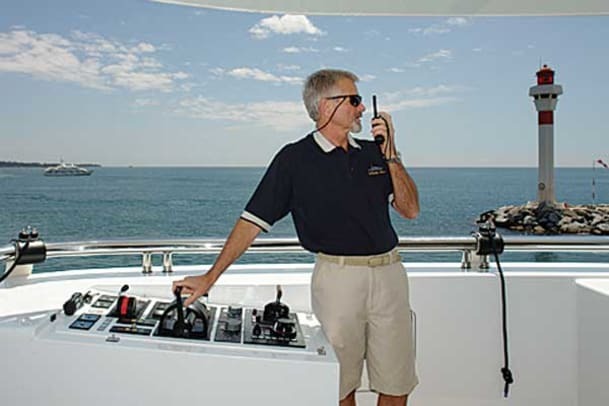 With a background in electrical engineering, he’s worked in yachts for nearly 15 years and served as chief aboard sistership Apoise for two of them. 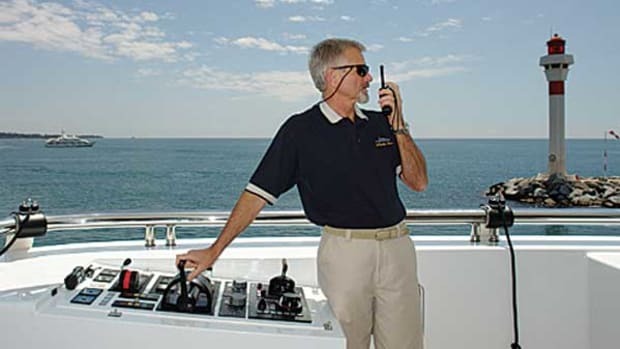 He not only knows the machinery well, he’s also had the satisfaction of seeing improvements and modifications he requested installed in the new yacht. Big as the machinery space is, however, it’s packed with equipment, from the four gensets and air-start compressors to the air-conditioning and watermaking equipment. It’s a lot to look after, but Hartigan is backed up by an engineering staff of two. "I haven’t got a lot to complain about down here," he says with a smile. There is plenty to look after above decks too, of course. One of Fontaine’s first appointments was a full-time purser, April Trigg from Canada, to look after the affairs of the yacht and her 19-strong crew. 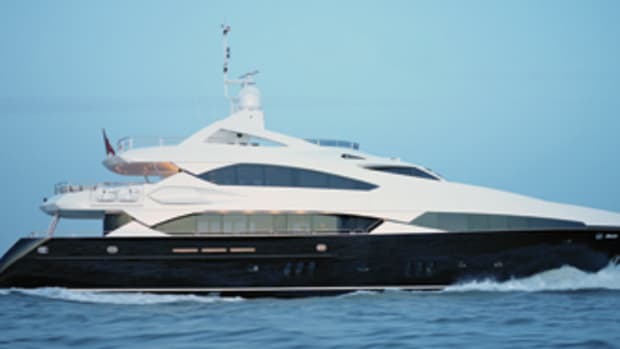 The deck comes under the command of Chip Mir, an experienced Philadelphian who has cruised the Mediterranean for almost 20 years, while the six interior staff are managed by chief stewardess Sylvia Spitzlay, from Germany. It is a demanding interior. (Fontaine confirmed that the owner intends to hire at least one other hand.) The rich, baroque decor was styled by Franois Zuretti, who worked closely from ideas put forward by the owner’s wife. Her yen for Orientalism is everywhere-jade animals, cloisonne vases, pieces of ivory, a scholar’s rock, and a Tang-style horse-while the colorful onyx and marble, and densely patterned veneers, were also specified according to her wishes. It’s a lively, busy interior, full of surprises-a place for fun rather than calm contemplation. The accommodation layout, too, emphasizes recreation. This point is well made on the sundeck, where along with oceanliner-style sunning spaces and an enormous pool complete with fountain, there’s a "sports bar" amidships with a spacious exercise area and a superb observation lounge looking forward. 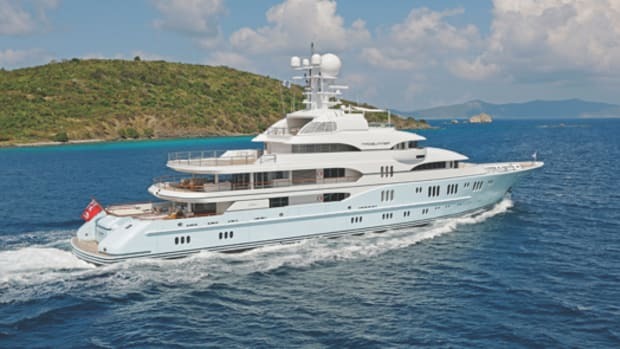 At the center a circular, glass-sided elevator goes right through the yacht, from here down to the tank deck. 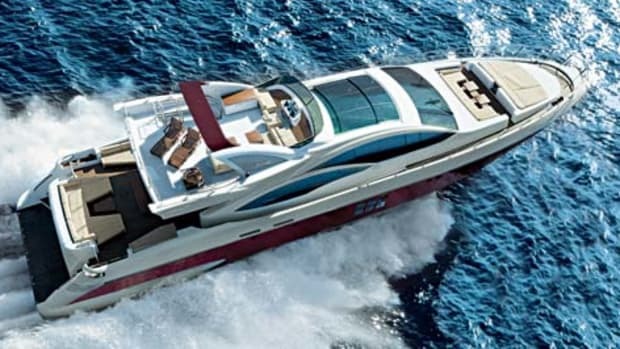 It’s programmed to wait on the main deck when not in use, to be ready for the owner. He is a carpenter, Fontaine explains-presumably quite a successful one. His apartment, forward, occupies as much area on the main deck as the formal saloon and dining area, further aft. 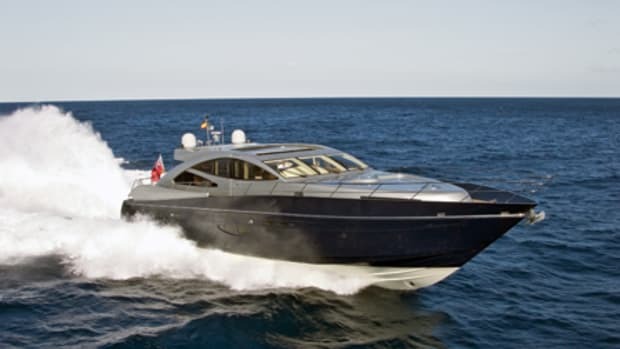 From a lobby on the starboard side to his private forward saloon, overlooking the foredeck through a curved gallery of windows, it is nothing short of palatial, with a study, bedroom, and bathroom all of a size that wouldn’t disgrace a top-notch hotel. It even has its own bar, one of seven onboard, says Fontaine-although the owner doesn’t drink. 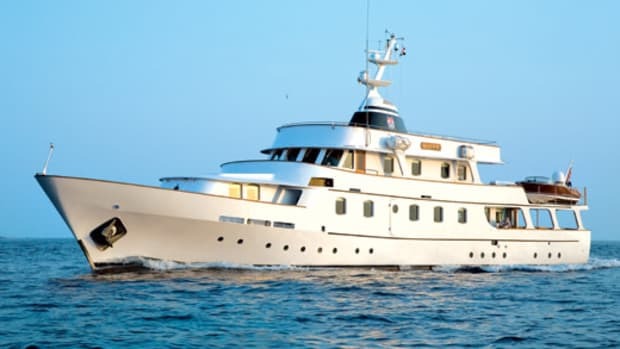 The guest sleeping accommodations are one deck down, comprising four large double cabins around a central lobby, each with a sofa and roomy en suite facilities and two of them with extra fold-down berths. There is a staff cabin on the starboard side, with three bunk berths and an en suite head and shower compartment. 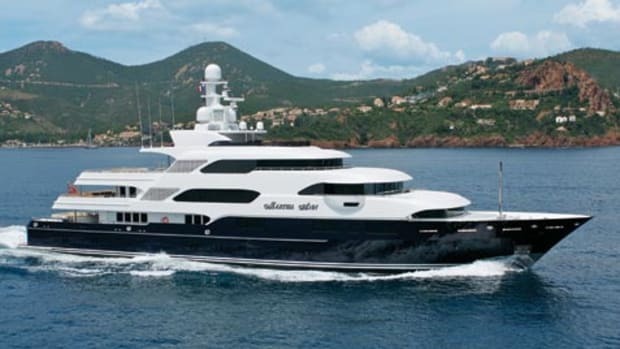 Here charter parties can install a nanny, personal chef, or secretary, who can be signed on as supernumerary crew-still allowing the yacht to entertain her full legal complement of 12 guests. The captain’s cabin is aft of the wheelhouse, with an office opposite, while the six double and two triple crew cabins occupy the forward part of the lower deck. One deck lower still there is an enormous crew mess, with a comfortable lounge, two dining tables, a galley, pantry, and serving counter, and even a good-size gym. 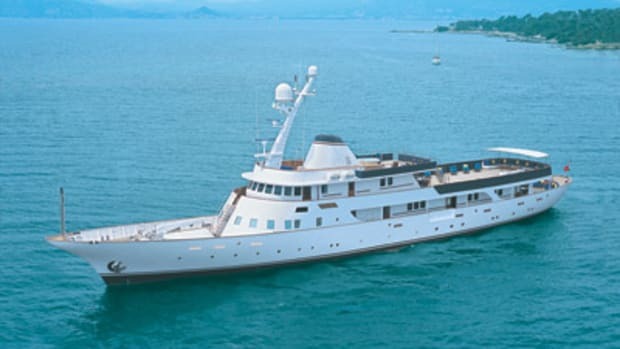 The crew can move around without disturbing the guests thanks to a series of service companionways and lobbies on the port side, from the bridge deck down. This hidden area of the ship includes a pantry-as well equipped as the main galley on many a yacht-from which to serve light meals and refreshments. There is also an extra linen room, to back up the main laundry down below. The galley itself is on the main deck. After two hours at sea, I was fairly familiar with Martha Ann’s accommodations but still unsure whether at any point I was facing forward or aft. I emerged into the daylight to find us coasting past the Iles des Lerins and turning in to the Baie de la Napoule, with Cannes a mile or so off the starboard bow. Deck crew scurried about organizing lines and fenders. In the wheelhouse, suddenly conscious of standing on 1,600 tons of steel, I remarked to Fontaine that although I had been coming here for years, for the first time the bay seemed uncomfortably small. "Everywhere seems like that to me now," he replied with a wry smile. Before long we were at the entrance to Cannes harbor and edging in, stern-first, to our berth alongside the outer mole. It was the only one the harbormaster could offer such a vast visitor. There was no Lady Moura here, or anything like her. Up on the bridge, 45 feet above the water, we were truly lords of all we surveyed. Lrssen ( (011) 49 421 6604 166. For more information on Lrssen, including contact information, click here.